What is Defenders of the Realm? 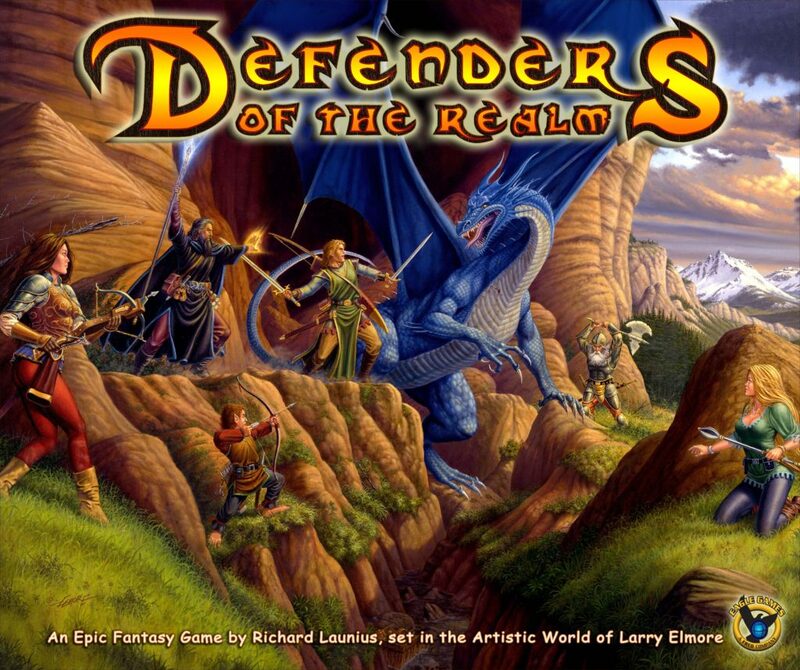 Defenders of the Realm is a fantasy cooperative game designed by Richard Launius and published by Eagle-Gryphon Games. During the game, players must work together to protect Monarch City from four enemy generals and their minions. The enemies are spawning and moving constantly throughout the game, so you and your partners must find a way to strategically deal with them so you don’t get overrun. Once players have each selected one of the eight heroes in the game, enemy Generals are laid out on the board with their minions. Each General starts with three of his or her three minions on the same space, but the rest of the minions are randomly placed around the board based on the Darkness Spreads cards that are drawn. Players have a number of actions they can take during their turns. You can move, fight minions by rolling dice, use special skills, or do a number of other actions. Each player can also use his or her special abilities during their turns to make some actions easier and/or better. Players always have the option to use the cards in their hands when they move or fight. After each turn, the active player draws two hero cards to add to their decks. 1-3 Darkness Spreads cards are then drawn (depending on how far into the game you are), which places new minions on the board and advances the Generals toward Monarch City. If three minions are ever in the same location and you have to add more minions, that location becomes overrun and tainted, which adds a tainted crystal to the location and spreads more minions to adjacent locations. You will lose the game if one of the Generals makes it to Monarch City. You will also lose if you don’t have enough minions to put on the board, if all of the tainted crystals are on the board, or if five minions are ever at Monarch City at the same time. You can only beat the game if you defeat all four Generals. The key to Defenders of the Realm is working cooperatively to chip away at the enemy minions to keep them from getting out of hand. You can talk about what cards you can use to clear out minions more efficiently, and you can even attack the Generals as a group. Download the official Defenders of the Realm rulebook (PDF) if you’d like to see a more detailed explanation of the rules. Defenders of the Realm is a fantasy adventure game, so you can expect to see dragons, orcs, demons and the like. The fantasy aspects don’t really shine through in this one, but it does a good job of making you feel like you’re on a tough adventure. This isn’t the most thematic co-op game on the market, but that doesn’t mean it was poorly designed or is a bad game (it definitely isn’t a bad game). Each of the hero’s special abilities make them feel distinct, which adds to the overall cooperative experience. It also makes it a bit more fun trying to beat the Generals with all of the different combinations of heroes. Not only are the heroes all a bit different, the four generals and their minions also have their own abilities, too. This is one of the main ways that Defenders feels different than Pandemic (in a good way). You clear all of the diseases the same way in Pandemic, but it takes different dice rolls to clear out each set of minions in this game. It was a brilliant idea to have players’ health be directly tied to how many actions they can take. If you are wounded, you can’t take as many actions during future turns. This is a subtle yet very thematic mechanism that more designers should use in their games. A minor complaint that we have for Defenders of the Realm has to do with its main board. It isn’t ugly by any means, but they could have made it a bit more vibrant. The majority of the board is a dull green and yellow, and the city circles are a bit too crammed together. If they ever release a new edition of this game, they simply have to make a better-looking board for it. 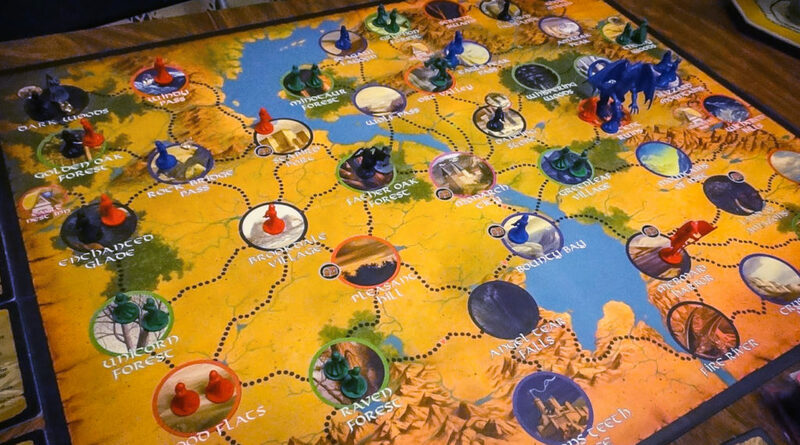 Defenders of the Realm is a well thought out cooperative adventure game that most board game fans will enjoy. It is difficult without being frustrating and each game is a fun puzzle to try to solve. It’s right outside of our top 40 co-op games, so we definitely recommend it to everyone. Eagle-Gryphon Games has already released a number of Defenders of the Realm expansions, and more are on the way. Thanks for taking the time to read our Defenders of the Realm review!